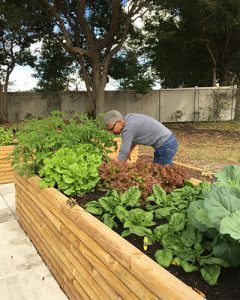 What began in 2013 as a small tabletop vegetable garden at Oak Leaf Landings, a senior housing facility in Kissimmee, Fla., is now a permanent 576-square-foot garden with raised beds that are accessible to residents with walkers and wheelchairs. 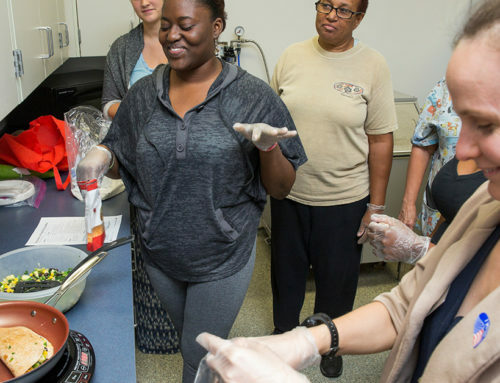 The UF/IFAS Extension Family Nutrition Program (FNP), which provides ongoing nutrition education and gardening support at Oak Leaf, started the garden with help from the UF/IFAS Extension Residential Horticulture Program. Since then, funding and volunteer hours from various community partners have expanded and improved the garden facilities, including building a security fence around it in November 2017. Twenty residents regularly engage in gardening at the facility. In addition to the health benefits associated with this activity, the garden supplements their consumption of fresh fruits, vegetables, and herbs. Residents also participate monthly in nutrition education provided by FNP. The lessons focus on healthy eating and food safety, and cater to the nutritional needs of older adults.